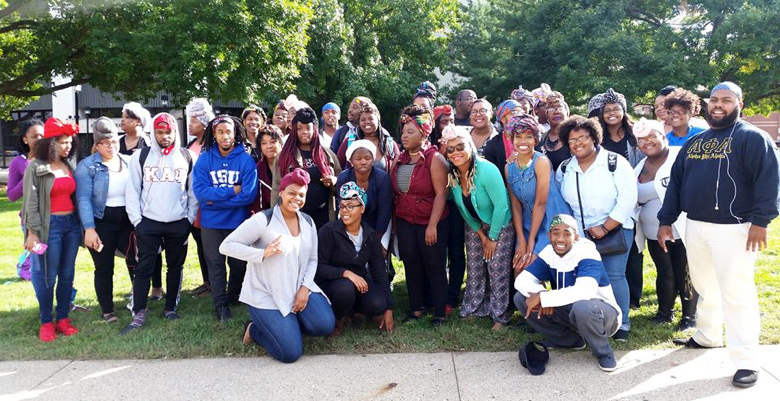 Indiana State University students celebrated the tradition of wearing African head wraps on Sept. 23 as part of #BlackGirlsWrapWednesday. Sistah's Speak, a student organization that creates discussion spaces for women of color, hosted an event to teach women about the significance of African head wraps and gather in solidarity with the worldwide movement #BlackGirlsWrapWednesday. "African head wraps have beautiful patterns and come in different colors and are a distinctive part of African culture that has survived the slave trade," said Erma Udota, chair of Sistah's Speak and communication major. Organization to eliminate the policy in their county and created the hashtag #BlackGirlsWrapWednesday to encourage people to rally behind their efforts and freedom of cultural expression. "To watch these young girls who had more to lose than gain by starting this movement really spoke to my heart," said Valerie Hart-Craig, assistant director of the Charles E. Brown African-American Cultural Center at Indiana State. "I thought, ‘What could we do to let her know that there are people on her side, who support her and will bring our sisters together on campus?'" After sharing her thoughts with the Sistah's Speak committee, the organization answered the call to action with a forum discussion, which quickly developed into the women talking about cultural identity, discrimination and appropriation. "African culture is a fad right now," Udota said. "You see people who are not black wearing traditional African hairstyles and people wearing dashikis as if it's the new style. These things connect us back to our roots from the motherland. Now, when black people wear these things, it's a problem, but white people are praised for being different if they wear it." Gabby Smith, a sophomore communication major, said she felt discriminated against for wearing her locs, a traditional African hairstyle. "I was on the phone setting up an interview date for an internship that I applied for when the woman asked me if I was African-American and how I wore my hair," Smith said. "I didn't really know what she meant by that, so I paused before I told her I wore my hair in locs. All she said back was, ‘Interesting.'" The forum discussion ended with head-wrapping demonstrations, but the issue around the criminalization of African and African-American culture lingered after several women shared personal experiences about how they felt attacked for representing their heritage. "The policy is still in place in the whole county and that's why the fight is not really over for us," said Liu Montsho Kwayera, one of the Florida students who began #BlackGirlsWrapWednesday. "We didn't want only high school students to participate in the movement, so it is really exciting to see how it's expanding to college campuses like Indiana State who support us." Sistah's Speak will continue to celebrate #BlackGirlsWrapWednesday in October in solidarity with Gibbs High School and as a display of cultural pride. The organization invites students, faculty and staff to participate in the movement by taking a picture in their head wraps and posting it on social media with the hashtag #BlackGirlsWrapWednesday. "It is definitely bigger than a head wrap," Udota said. "This is how we express ourselves as a people. That is why I support the young ladies at Gibbs High School, because I don't know what I would do if I couldn't wear my culture." 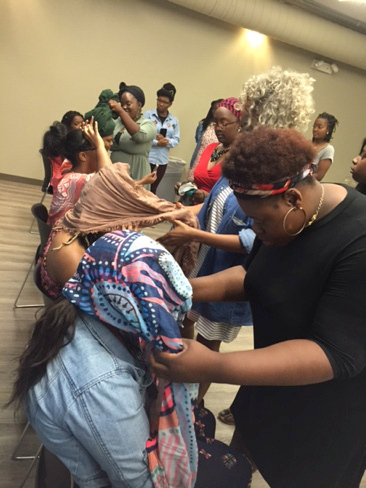 Sistah's Speak hosted an event to teach women about the significance of African head wraps and gather in solidarity with a worldwide movement.